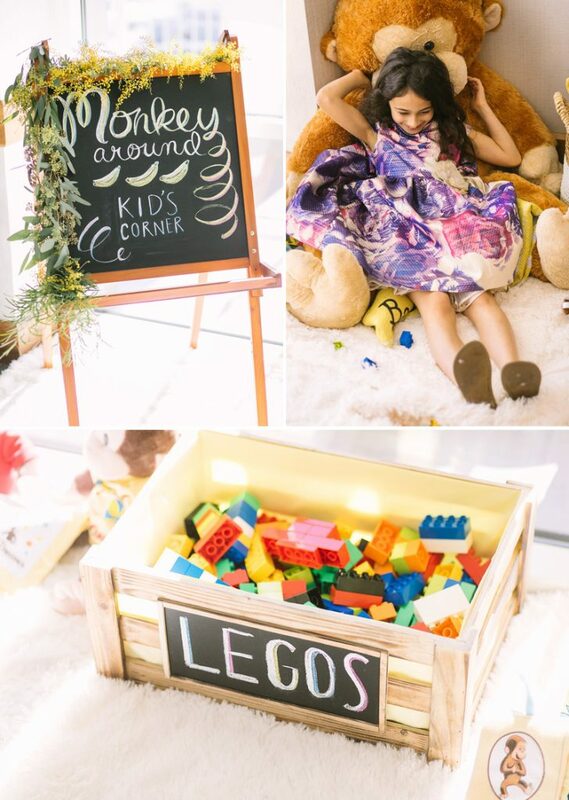 We set out to create a playful design that both children and adults would enjoy. 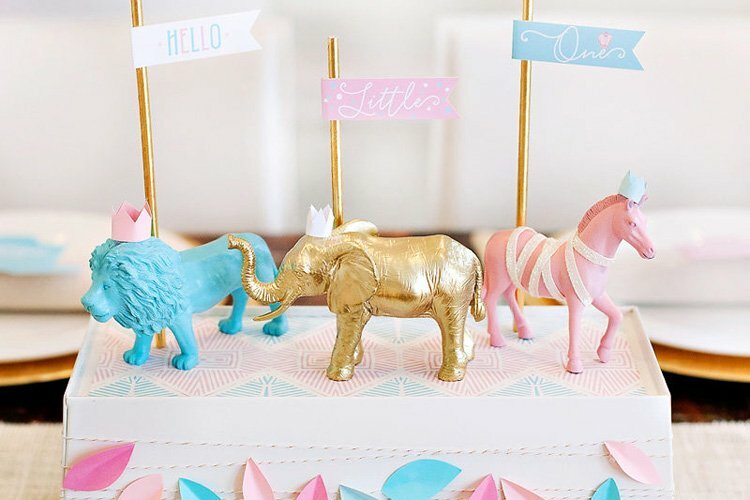 We chose lively children’s patterns, like polka dots and stripes, and focused on the typical baby shower/gender reveal colors – pink and blue – but in brighter hues. 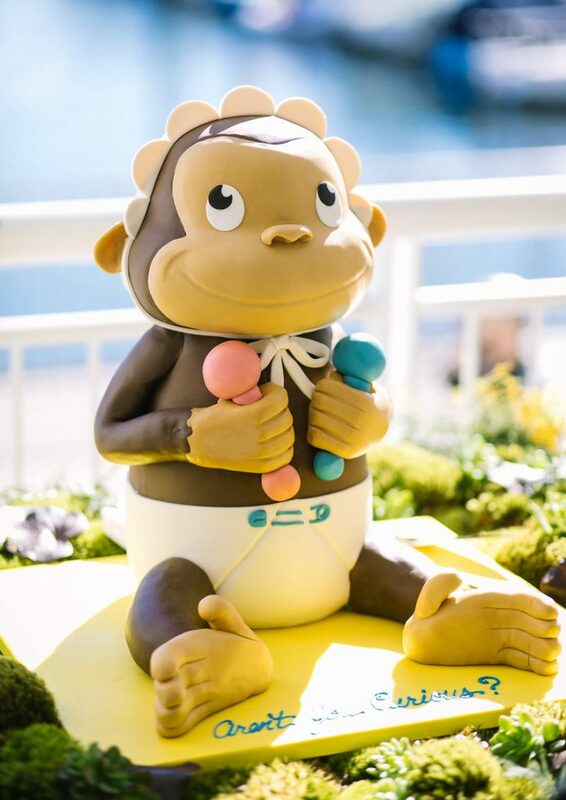 As our clients could not wait to read to their new baby, we selected Curious George, Aren’t You Curious? as the theme for this gender reveal party. 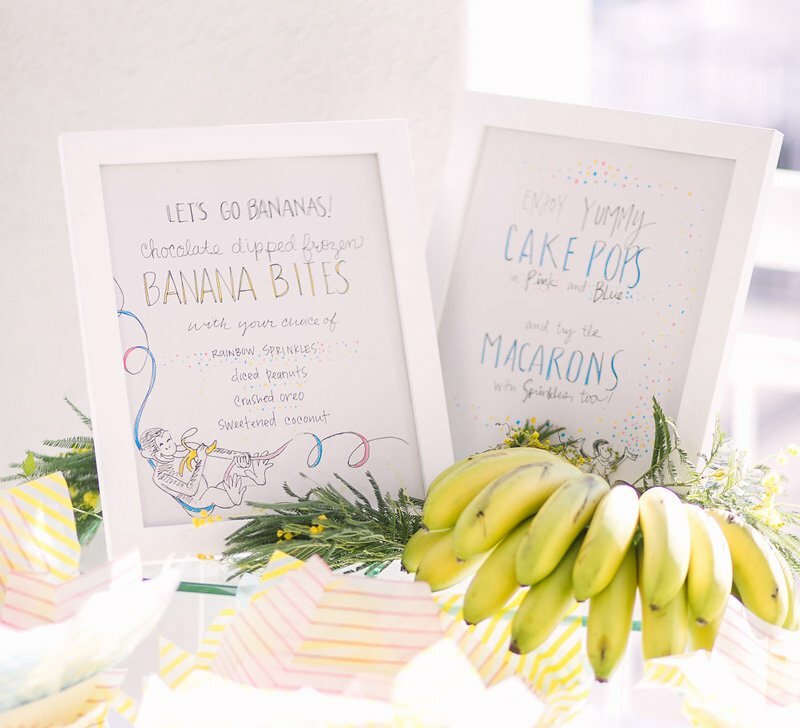 The space was also filled with jungle-inspired florals in yellow, white and green… and, of course, baby bananas were incorporated throughout! 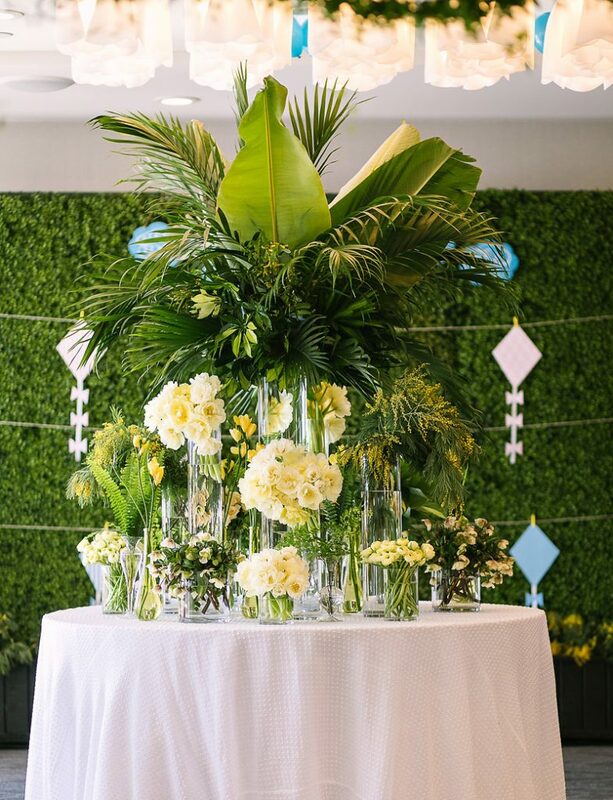 We stacked brightly painted 2’ cardboard boxes in a pyramid shape at the entrance to create a larger-than-life welcome for the guests and a unique photo backdrop. 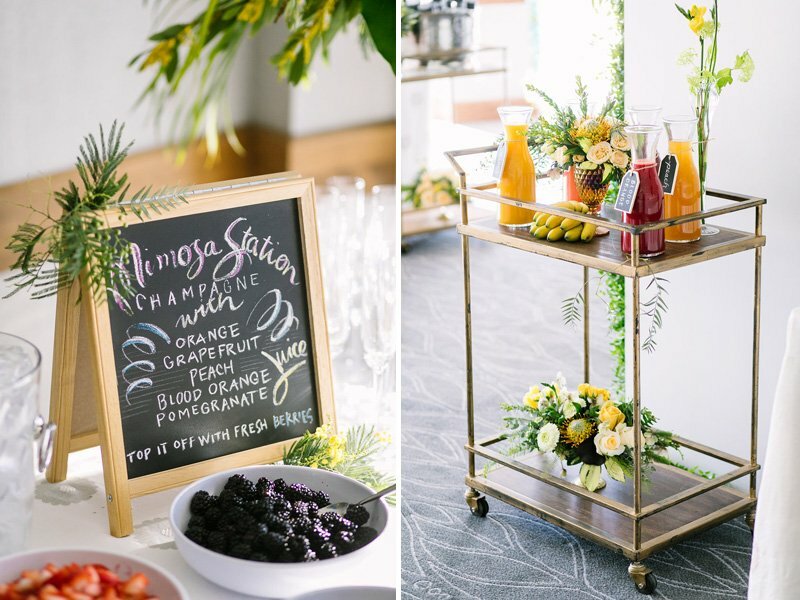 The same bright colors, playful patterns, and “Aren’t you Curious” theme were carried throughout the event space. 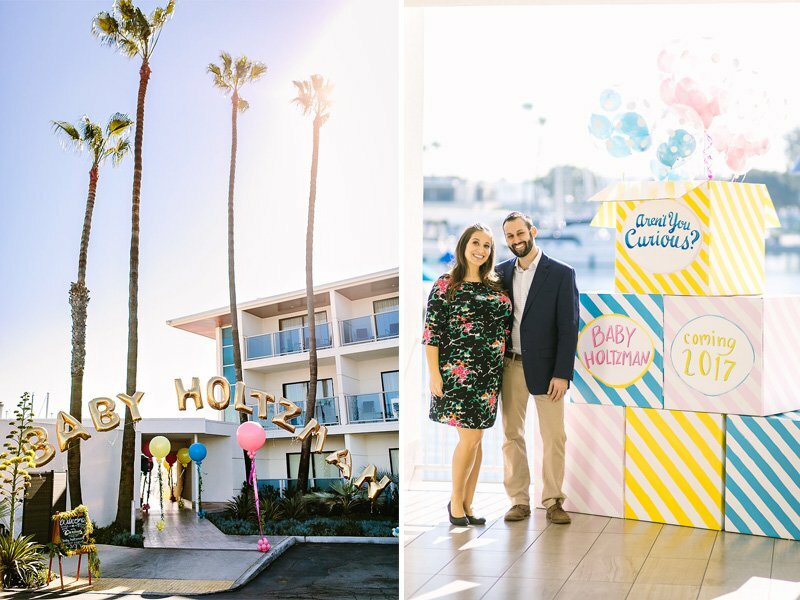 DIY Details: Lettering Studio West painted six 2-ft white cardboard boxes with pink, blue, and yellow diagonal stripes and party phrases (i.e. “Baby Holtzman” & “Coming 2017”). The box flaps were hot glued down to ensure they sat evenly. For the top box, we also painted the inside to ensure the pattern was visible when the flaps were open, then anchored balloons within this box. 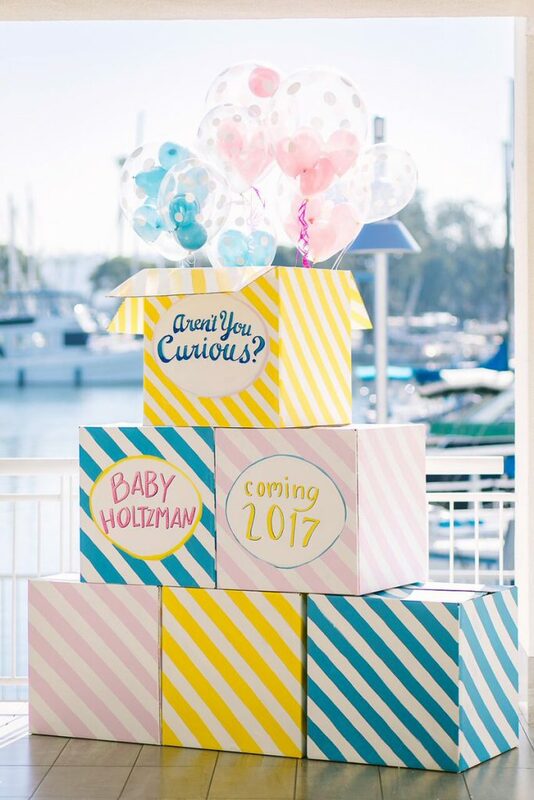 The boxes were strategically placed in front of the marina for a pretty photo backdrop! 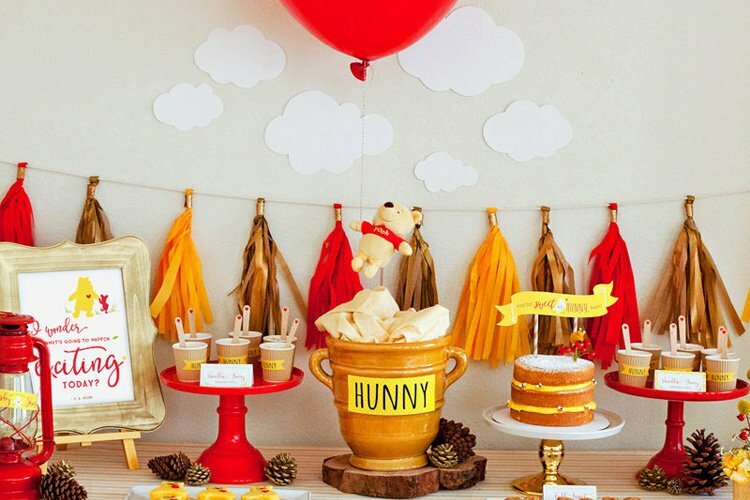 Our interactive guest book was modeled after the book Curious George Flies a Kite. 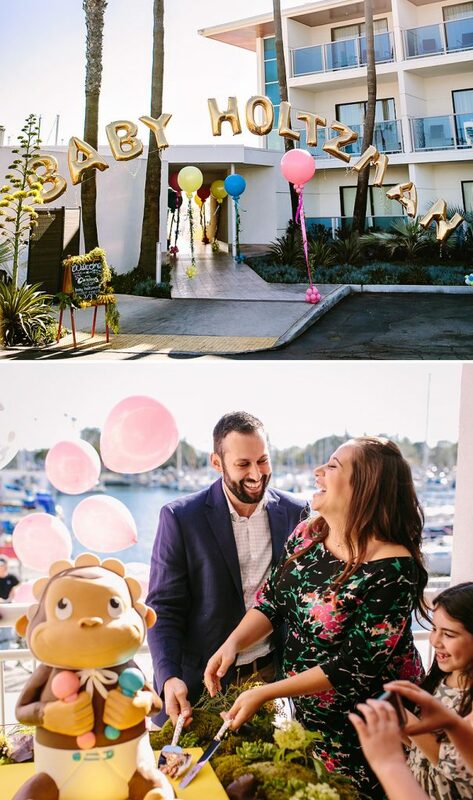 Guests had fun guessing the baby’s gender and decorating kites in pink for a girl or blue for a boy. The pink and blue creations were strung across 3 hedge panels using twine and mini yellow clothespins. DIY Details: We rented three 4’ x 8’ hedge panels for this project. 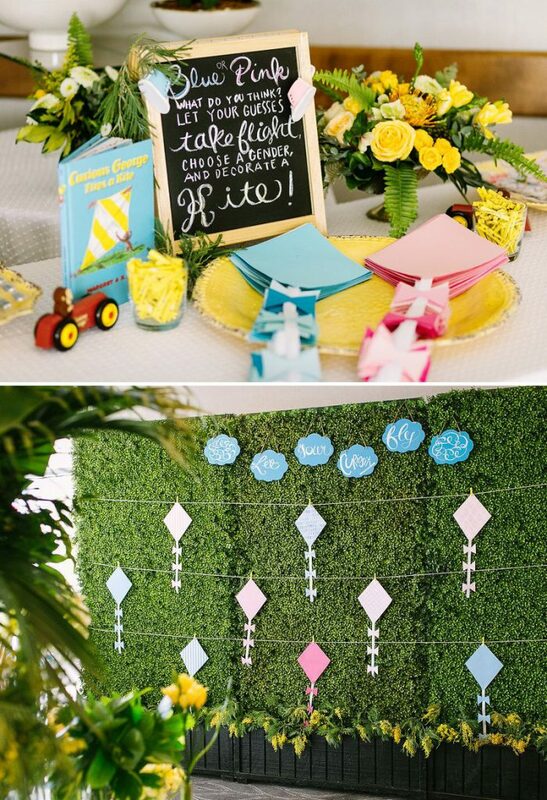 Blue wooden cloud shaped signs were calligraphed with “Let Your Curiosity Fly” and hung above the 3 rows of twine. We pre-made pink and blue kites using card stock and ribbon. Plenty of pink and blue baby-themed stickers were available to the guests for their kite decoration. 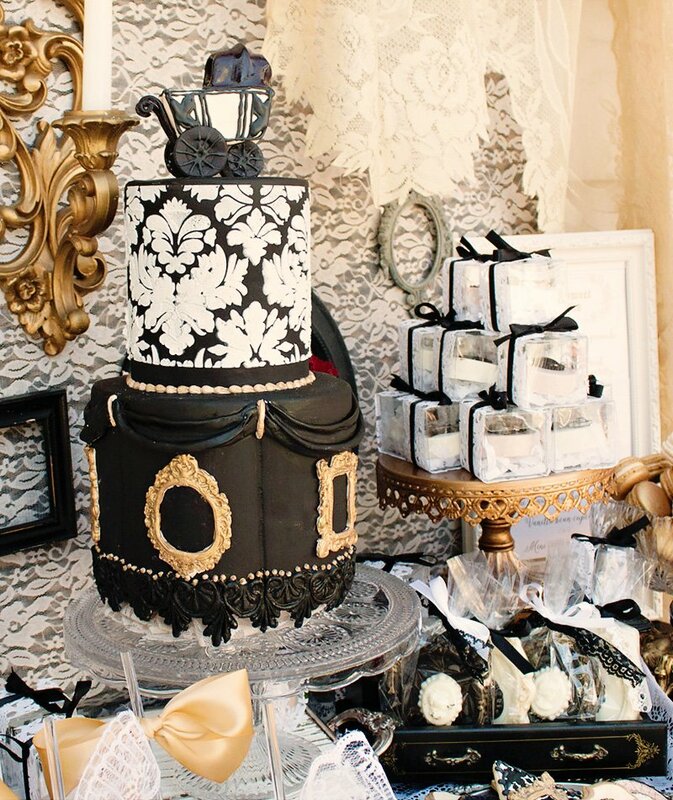 We created a whimsical and delicious “Sugar & Spice & Everything Nice” Dessert Cart that was framed with sheer fabric panels adorned with a cute pom pom trim. 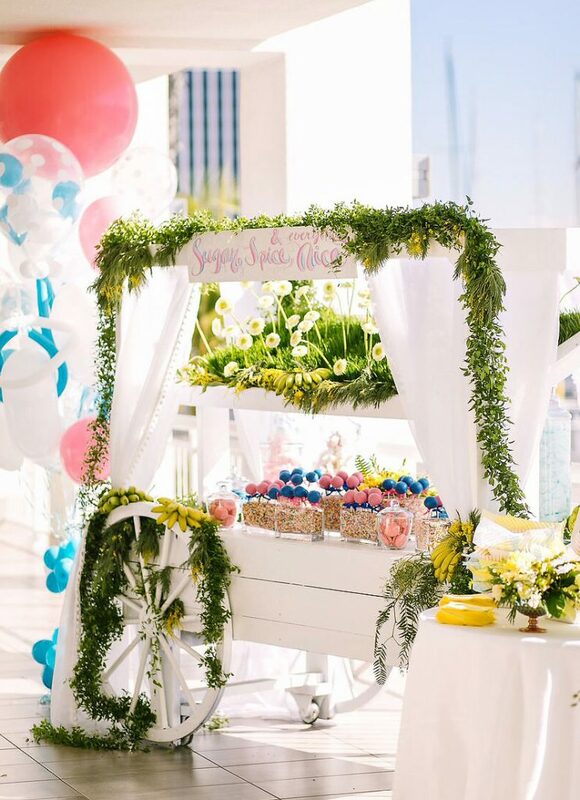 La Petite Gardenia created a grassy knoll with daisies for the top level and draped the cart with jungle garlands and baby bananas. 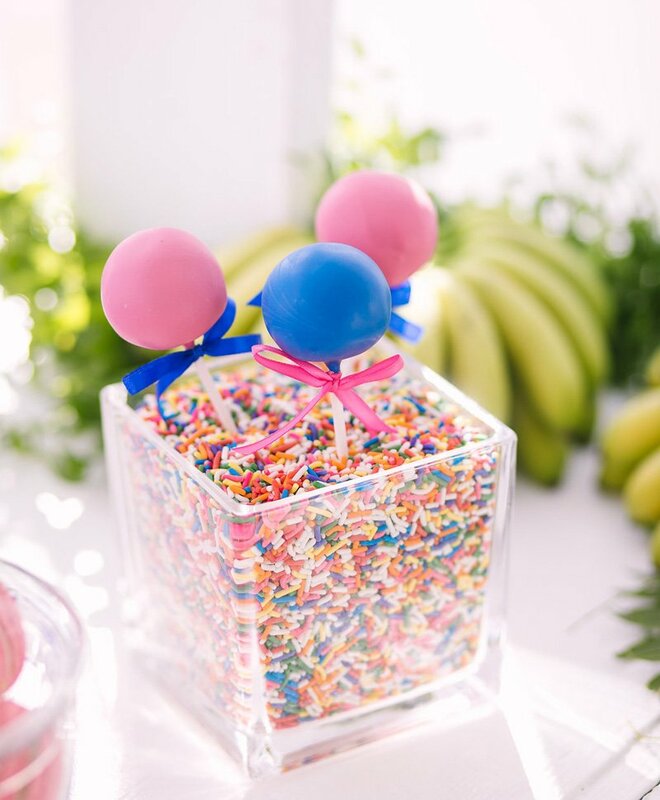 Mimicking a garden, curious cake pops with inverted pink and blue centers “grew” out of glass vases filled with rainbow sprinkles. 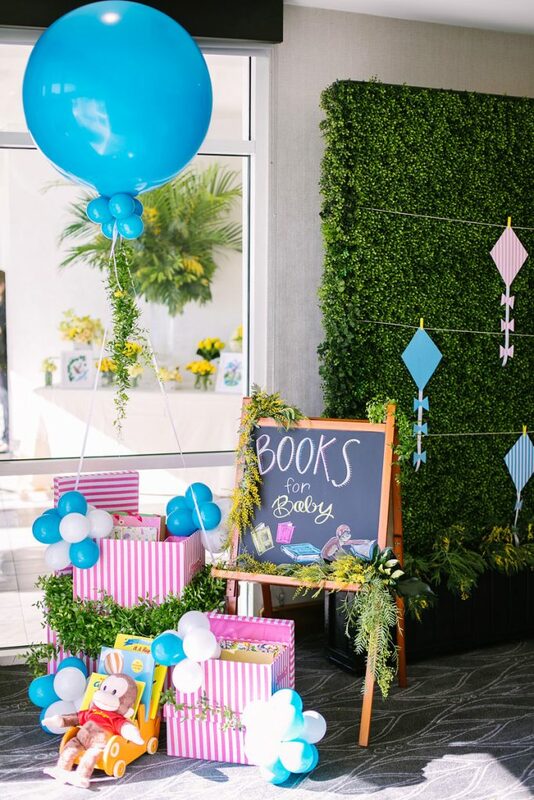 We also filled apothecary jars with blue and pink macaroons, cotton candy, and marshmallows – all childhood classics! 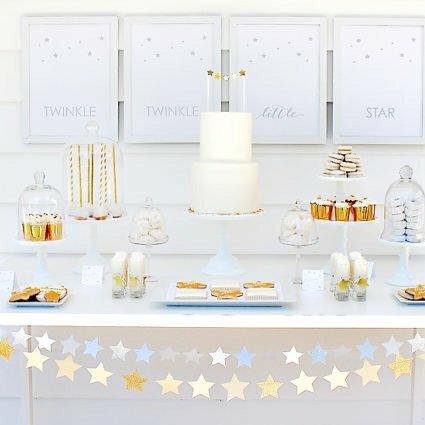 DIY Details: For this dessert station, we started with a basic white market cart. The hand-painted “Sugar & Spice & Everything Nice” sign was attached via two sawtooth picture hangers attached to the back of it, then looped the sign to the cart using zip ties. 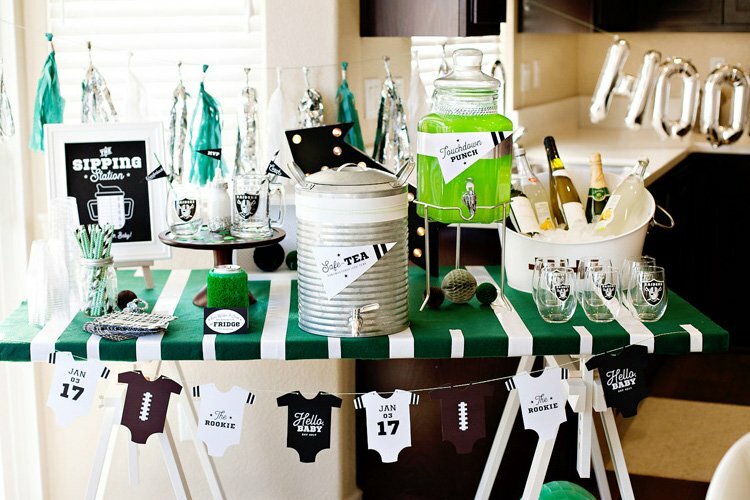 The sheer fabric panels draped along the sides were used to soften the look of the cart. To ensure the cake pops in the sprinkle vases stood up straight, we first inserted a piece of styrofoam into the center of the vases, then poured the sprinkles around to cover the styrofoam. 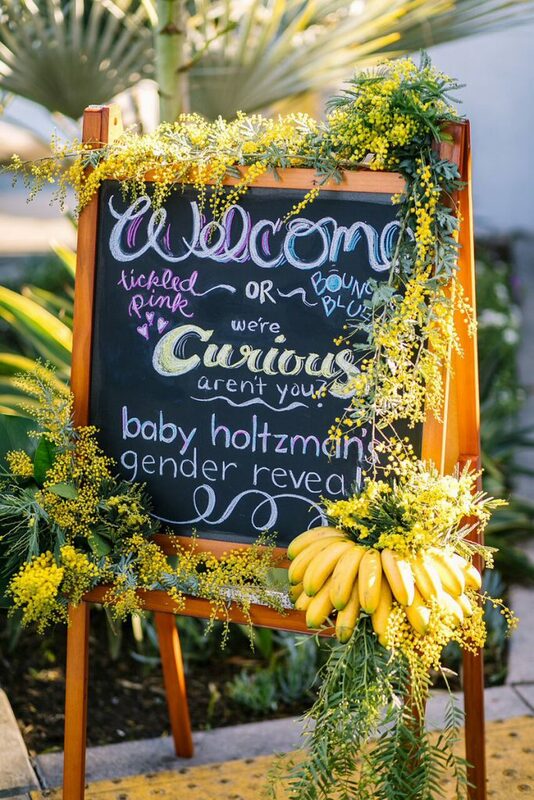 In order to translate the playful theme into signage, we used children’s chalkboards and Curious George inspired verbiage. 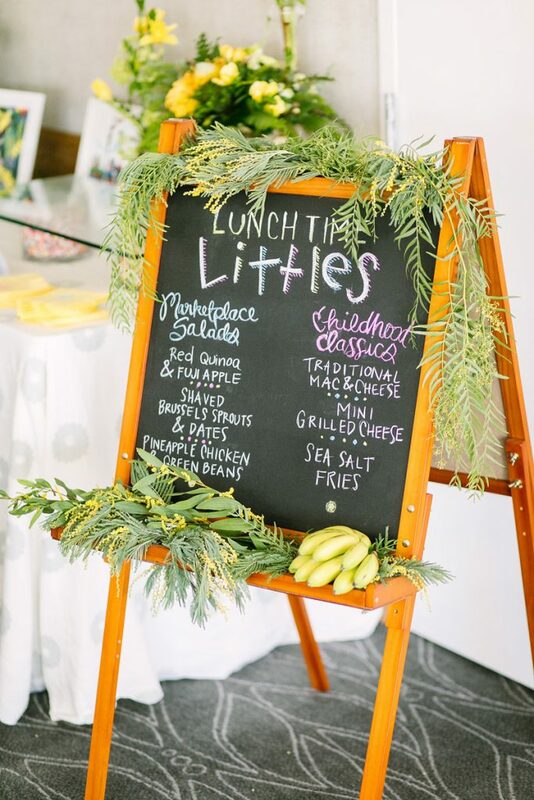 We decorated the easels with jungle garland and baby bananas, and created cheeky phrases for each station. Blue or Pink, What do you think? Let your guesses take flight, Choose a gender and decorate a kite. 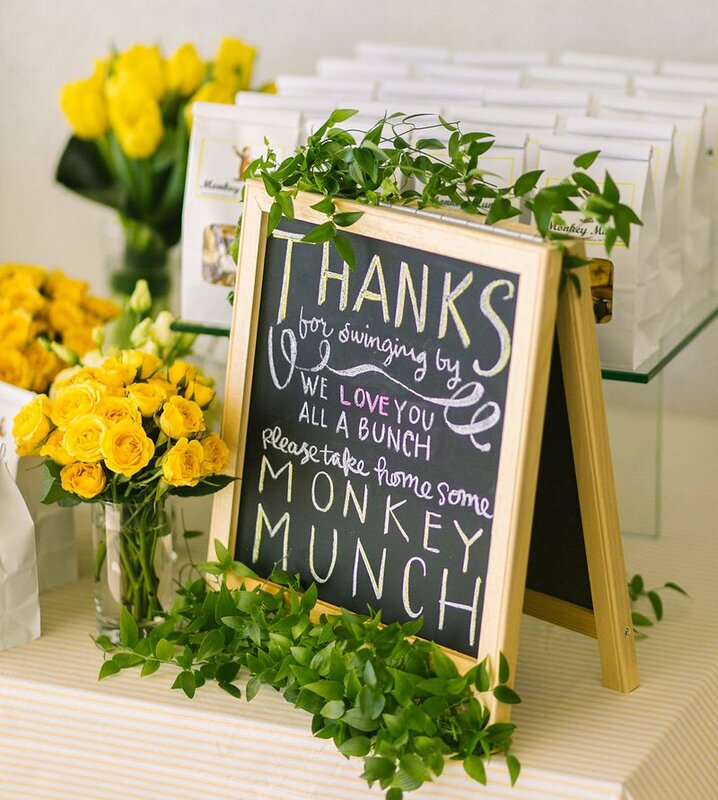 Guests went wild for our “Monkey Munch” party favor! A mix of bananas, chocolate chips, coconut, and peanuts made for a delicious sweet and salty to-go snack. 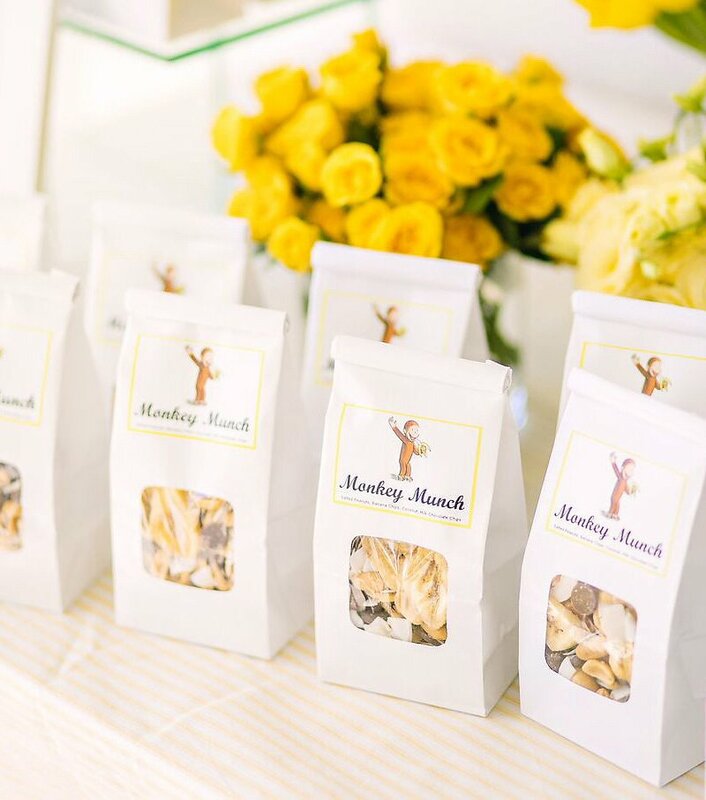 We packed the custom trail mix into kraft bakery bags with custom labels. 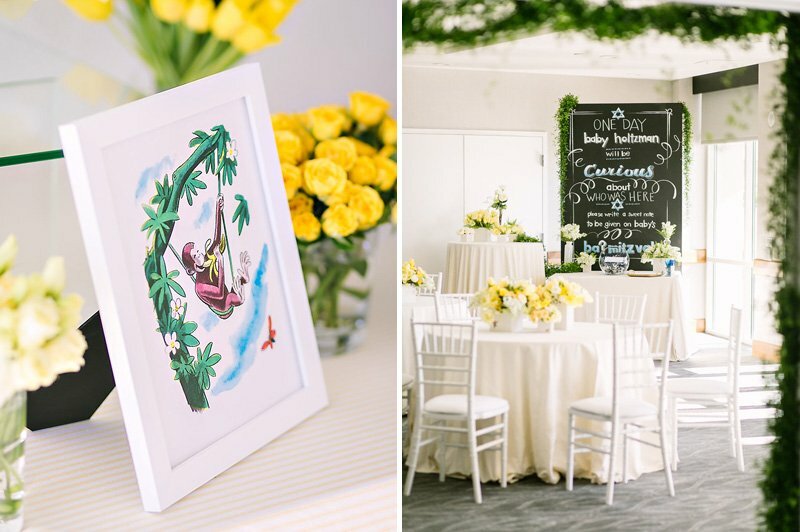 The Monkey Munch looked extra sweet next to groupings of yellow floral arrangements and framed pages from the Curious George books. 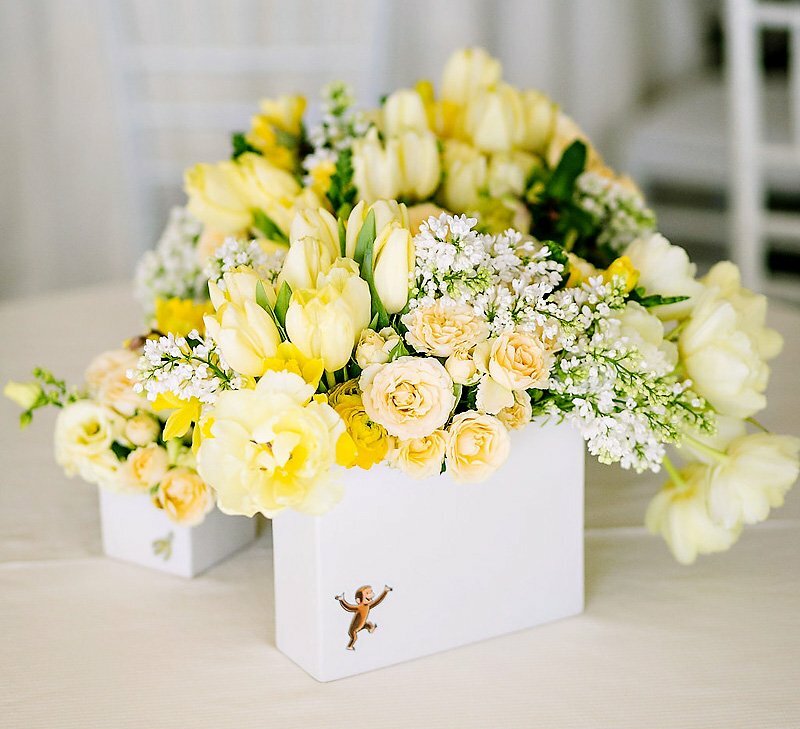 Check out even more photos of this event over at Ilana Ashley Events! This is a really original idea. I love it! You can find this design for the printable sign here!